The Atom was finished and registered only six weeks after the Dunkirk evacuation in 1940. Aston Martin's contemporary owner, enthusiast businessman Gordon Sutherland, had the car designed and built by a dedicated design team under engineer Claude Hill. At that fraught time when park railings, pots and pans were being melted-down to aid the War effort, the Atom was amongst fewer than 750 private cars to be UK registered in the entire year. While the mighty American General Motors Corporation's 1938 Buick Y-Job is widely accepted as having been the first concept car of all, at the other end of the size spectrum the then-tiny Aston Martin marque had the Atom in public road use during 1940. Gordon Sutherland himself explained that "The whole point of the Atom was to make the smallest, lightest, enclosed saloon possible". It was intended to combine the performance, roadholding and handling of the finest contemporary sports car with quietness and the comfort of an aerodynamically efficient saloon body, easily modified and economically produced. The 'atom' being the smallest, most powerful thing conceivable – the essence of everything – it was chosen as the perfect name for this technically advanced, futuristic Grand Touring car. The Aston Martin Atom's wartime press reception was ecstatic. 'The Autocar' described it as: "The future in the present...a complete breakaway from existing Aston Martins and the general run of British cars...The saloon body breaks with British car convention...see it as the comfortable, convenient sports car of the future..."
'Motor Sport' magazine enthused: "This is a machine which convinces you it is all the way a winner...", while 'The Motor' was emphatic that "...in this car we can see the new order of motoring...". This unique frontier-breaking 90-100mph 2-plus-2 Coupe was used by Mr and Mrs Gordon Sutherland both for personal and private transport, their children often traveling in its cozy rear seats. 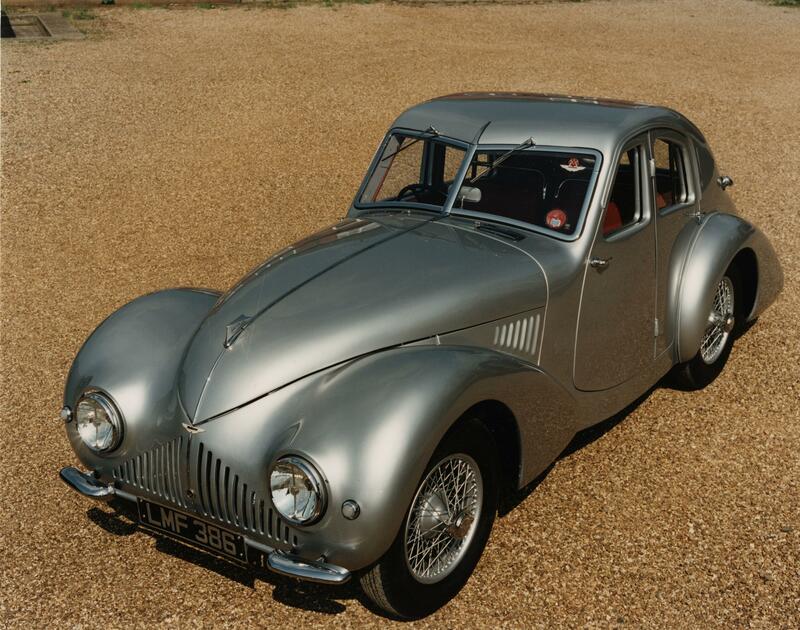 Lack of publicly available fuel during wartime saw the Atom stored at his factory for up to three months at a time, but Gordon Sutherland knew its technology-proving value for a postwar resumption of Aston Martin production. He drove it personally for more than 100,000 test miles and immediately postwar the experience of driving the Atom persuaded industrialist David Brown to buy the company that had created it. Amongst the developments Gordon Sutherland listed for the time when materials might again become available were many incorporated postwar into the first of the David Brown-owned Aston Martin company's DB-series Grand Touring cars, the now-renowned Aston Martin DB1, DB2, DB2/4 and 3. Today the Atom, taxed and tested, has completed some 250,000 miles. Its discerning ownership - including two distinguished race/rally drivers - has changed only once in the last 49 years, and this unsung little jewel has long been painstakingly conserved and maintained by one enthusiast owner. He has now entrusted it to Bonhams for the Goodwood Festival of Speed Sale on June 27. Bonhams holds the World record for the highest price achieved for any Aston Martin sold at auction and Group Motoring Director James Knight describes the Atom as: "Plainly one of Aston Martin's absolute landmark designs, and certainly one of the most exciting one-off British cars we have ever been asked to offer. It is unique, it is super sophisticated, and when one considers it within the context of 1939-40 it represents a monumental achievement. That the Atom has survived in almost constant use, and is today so beautifully conserved in highly original order, is a great tribute to the enthusiasm and taste of the Aston Martin connoisseurs who have fostered it for so many years. "Placing a value on such an important and unique motor car is nigh on impossible but it has all the right credentials: a well respected and international marque; concours condition; originality, provenance, useability, rarity and of course its historical significance. Our initial thoughts are that it will realize many hundreds of thousands and certainly has the potential to achieve more. Time will tell though, and by offering Atom publicly at auction, we will let the market determine the value."